Hinged chain conveyors – also called slat band conveyors – playing an important role in the industrial conveying technology due to their robust, shock-resistant design. 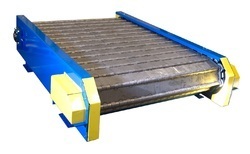 With this conveyors, you are able to transport small and large goods even if they are hot, efficiently. Due to large surface area, these are effectively applicable for heavy duty load handling for the material to be conveyed. Hinged slat chain conveyors are especially very useful for conveying particularly wear-sensitive parts like cast parts, welded components, gear wheels, glass bottles, etc. Large point loads possible on the chain. Available in various material of construction like Mild steel, Stainless steel etc. Easy to dismantle & assemble. Transmax Engineering Industries.Manufactured all type of material handling conveyor system and spares, for the major type of application and field, are manufactured apron type bed plats especially for Drying, Roasting equipment. Our apron or say hinged type bed plats are used and substitute for all major dryer and roster manufacturing company.Along with bed plate’s Transmax manufactured supporting accessories for bed plat assembly like, Chain Link, Travelling Guard, Support Plate, Sprockets, etc…..After putting in years of experience, in-house research development and other assimilating technology that is available internationally, we have perfected our state-of-the-art apron conveyors.Transmax bedplate assembly provides an ideal and cost-effective solution for applications like conveying and transferring a wide range of materials like grains, nuts, food items, chemicals etc. for critical processing application, such as high-temperature steam, dry air, chemical acids, hot oils, etc. These bed plates provide the proper open area for exposure towards desired processes.Transmax offered various size of bed plate with the variety of perforation in major type of material quality like Mild steel, Stainless Steel Grade 202, AISI 304, AISI304L, AISI 316, AISI 316L, AISI 310, Galvanize, etc.